Regional Specialties--what's up with them, exactly? Sure, you have the big famous ones--New York bagels, Chicago deep dish pizza, San Francisco sourdough. But what about those not-quite-as-famous ones, existing just a little bit under the radar? Those ever-present little food items that you might even stop noticing simply because they are ubiquitous--it might take a trip or a move from your hometown to raise your awareness. But why is this, exactly? Why is it that kolaches about in Texas but are sparse elsewhere, that black and white cookies reign in the Mid-Atlantic, but don't seem to exist in the Pacific Northwest? Yes, these are the questions that fill our minds and color our days here at Cakespy--and right now, that regional bee in our bonnet is The Pink Frosted Cookie. If you don't live in Seattle, you might not even know about this cookie (while it exists elsewhere, we've never seen it in quite the same proliferation in our assorted travels); even if you do live in Seattle, you might not have stopped to question why it is that this confection is always around--gas stations, delis, grocery stores, drugstores--everywhere! What makes this relatively simple cookie, comprised of a rich shortbread base and a very generous, very sweet frosting topcoat, so popular? Luckily for you, we found out about its history so you don't have to. 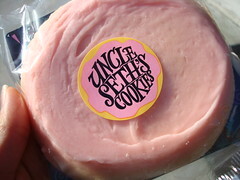 Uncle Seth’s Cookie was a concept developed from a passion of fun and feeling good. From the high mountain tops of Bali came the inspiration for the feel good cookie. Danny Brown, the originator and inventor of the Original Pink, also known as an Uncle Seth Cookie, found a kindred spirit in a man named Seth. Seth moved from a crazed urban setting better known as the City, to live his dream of peace in the mountains. The namesake of the Uncle Seth Cookie gave tribute to this man named Seth who changed his life for the sake of fun and happiness. To bring a bit of that passion and fun to light, Danny created a cookie that says eat me because you can. This cookie has a good aura. After nine years of hand rolling this Danish Shortbread, Danny too, decided to head for the hills. Mostly Muffins purchased Uncle Seth’s Cookies in 1996 and Danny was off to live in Hawaii! Mostly Muffins now proudly carries on the tradition of fun and feeling good by serving the Original Pink to the entire Northwest community. 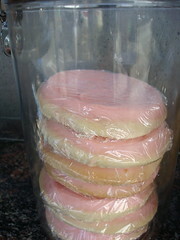 Eat one of the Original Pink Cookies and you can’t help but smile! Okay, so it proves that fact can be stranger than fiction--without, of course, explaining why the cookies are so popular, or why they thrived in the Seattle region. Our theory? So happy you asked. In our minds, the first aspect is timing: the cookie got its start being sold in coffee carts just as the coffee business was starting up in earnest in Seattle; naturally, they would appeal for the same reasons that coffee is so popular in the area--the climate just begs for rich treats and coffee during those rainy days that take up oh, eight months of the year. The second and perhaps more important aspect? Duh--The frosting color. there's no secret that pink frosting tastes better than any other color. See? You've learned something new today! And while the pink frosted cookie itself seems to be a Seattle phenomenon, we do believe that the concept behind the regional specialty is universal, so approach your local treats mindfully; whether it's strange, cute or plain scary, there's bound to be a story behind that confection! 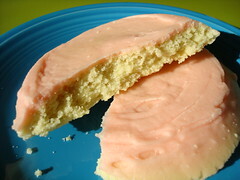 For more information on the pink frosted cookie, visit mostlymuffins.com. 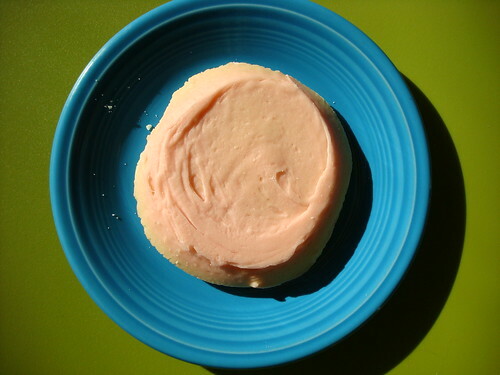 Not in the Seattle area but want a pink frosted cookie? We hear you: similar-looking products can be found online here and here, or--even better, we found a recipe which is said to yield a very similar taste to the original Uncle Seth's Cookie, right here at allrecipes.com. Cakespy Note: Want our Cake Gumshoes to research a particular baked good in your area? Let us know! Feel free to leave a suggestion for us to sleuth in the comments or via email to jessieoleson@gmail.com.